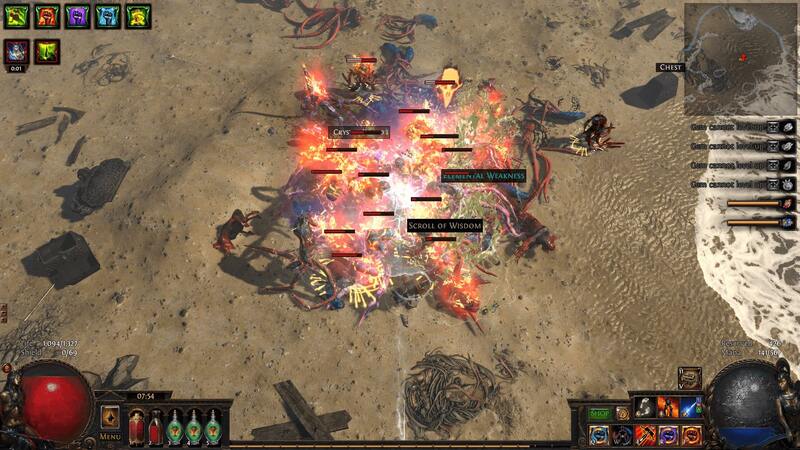 Over the years, Path of Exile has grown. A lot. To the point where meeting up with other people (in-game) has become… a bit of a hassle. This mostly holds true for newer players though, as these are more likely to have a hard time figuring out where this or that place that their friend is currently wreaking havoc is at. An issue that Grinding Gear Games will be solving in the near future, while also adding several other party-related quality-of-life improvements. Once this change goes live, players will be able to not only teleport to other players by simply clicking on their portrait (which does, for obvious reasons, require you to be in their party), but also… team up in the very first zone. An interesting addition to say the least, and honestly, not one I suspect many will be using. Veterans could help ease newcomers into the game this way, I suppose, but aside from that – don’t see much use for it. Anyway, on top of that, things like enabling others to automatically join your party without even inviting them first is also being worked on, and fortunately, it will be ‘on a per-friend basis’, as otherwise it would simply be much too easy to, well, abuse. But while all that stuff is interesting, what I’m far more excited about is the ‘optional downleveling’ feature, which will allow players of all levels to enjoy the game together. Gone are the days of not pushing far ahead of your friends in terms of character levels, which has been a bit of an issue for me in the past, throughout… so many darn leagues. According to the forum post, these changes will be rolled out “over the current Incursion cycle (with the first three being done in the next few weeks)”, so we won’t have to wait long for the good stuff.